Cyclopropanation refers to any chemical process which generates cyclopropane rings. Cyclopropanes may be quite readily prepared by the addition of reactive species called carbenes to the double bond of alkenes. In general structure of carbenes, the central carbon atom possesses an electron sextet. Although neutral, carbenes are electron deficient and act as electrophiles toward alkenes. The unusual substance diazomethane, CH2N2, is a yellow, highly toxic, and explosive gas. It decomposes on exposure to light, heat, or copper metal by the loss of N2. The result is the highly reactive species methylene, H2C:, the simplest carbene. When methylene is generated in the presence of compounds containing double bonds, addition takes place to furnish cyclopropanes. 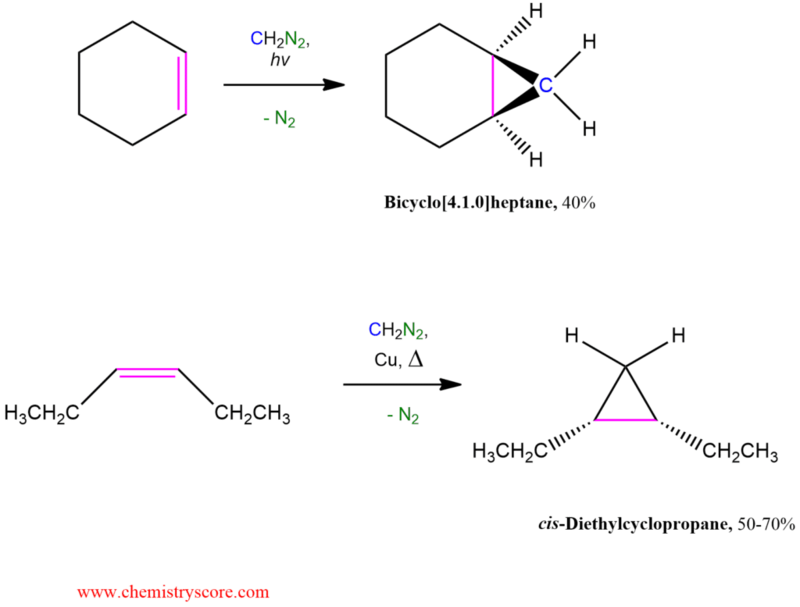 The process is usually stereospecific, with retention of the original configuration of the double bond. Simmons-Smith reagent, ICH2ZnI2 is obtained when diiodomethane is treated with zinc powder (usually activated with copper). This species is an example of a carbenoid or carbene-like substance, because, like carbenes, it also converts alkenes inro cyclopropanes stereospecifically. Use of the Simmons-Smith reagent in cyclopropane synthesis avoids the hazards associated with diazomethane preparation.